Your West side view of the shipping lanes from the large roof top deck. Modern bright open kitchen, you can enjoy the West side view while cooking your favorite meals, brand new dishwasher. Unique Open beam wood ceilings, large picture windows to enjoy your view of Admiralty Inlet, brand new carpeting in the living room. 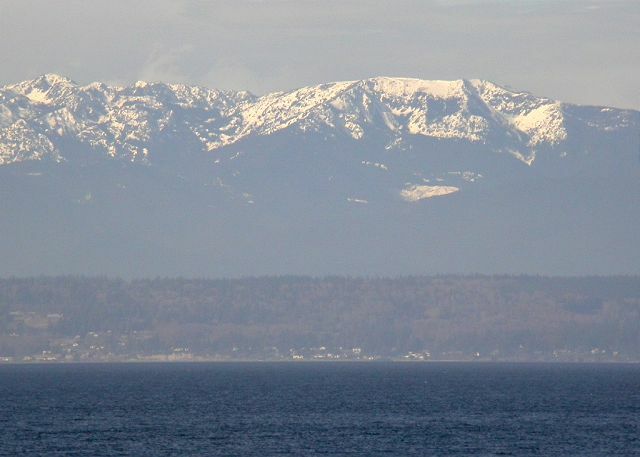 Wondering what to see and do while on Whidbey? Check out Living Whidbey and our event calendar. My family loved the house! It was plenty of room for us and was nice having two different living areas for people who were on different sleep schedules. Thank you for your comments. We are so happy you enjoyed your stay on Whdbey Island. We hope we can help you with your next stay on the Island. Overall our stay was great. It is spacious and a beautiful location. We even got to feed a deer in the yard. There were some things that could have been better. As a number mentioned it could have been cleaned better in some details. It wasn’t dirty but being closed up for a couple days it was musty. Once we opened it up that lightened up. The carpeting could stand to be replaced and the windows need screens especially in the summer without A/C. But we loved the family time and the beauty it provided us. We would go again. Thank you for your feedback. The property is in a beautiful location. So glad you were able to experience the closeness of our friendly deer! We will check into the screen issue. There should be screens on all windows. Our properties do get a deep clean at the end of the peak season, which is at the end of September. Our high season is June through September and there is a good cleaning between each guest, but windows, and deeper items can't always get done during peak season. If anyone is not satisfied with the cleanliness when they check in, we ask them to call us and we will send in a cleaner if desired to fix anything we missed. Cleanliness is very important to our company. Thank you! House was good. Did not know it had as many steps as it did. Not suitable for disabled person like me. Toilet handle was broken when we got there, a pain to use. The picture is good but doesn't show how difficult it is to get to the beach below. We assumed beach would be closer. Very hard to find the house as directions were inadequate. Thank you for your comments. Thank you for recommending the location that you stayed at. We are sorry that it wasn't a perfect fit, but we hope that we can find a location that better suits your needs next time. We love Whidbey Island so wanted a place that our kids and grandkids could enjoy as well. Everything was great,except we did not take firewood with us. The lower floor heats up very slowly, so a fire in the winter would have been perfect.Next time we'll know. Nice to hear you had a great time with family on Whidbey Island. Thanks for your review. The view was awesome. My husband loved watching all the ships coming back and forth. The house clean and kitchen well supplied. This house is close to three other homes so we were awakened two out of four mornings to lawn mowers, construction and loud barking dogs. If you are an early riser, this place is perfect! We're so glad you enjoyed the view of the water and of the ships, and that the house was clean and that the kitchen was well supplied. We apologize, there is currently construction going on near there right now, but it is typically a nice, quiet spot. Thank you for your review! Very good place with a excellent view. Good living room and outside deck. One suggestion is - The rooms had lots of dust and they could have done a better job in cleaning the house and towels. 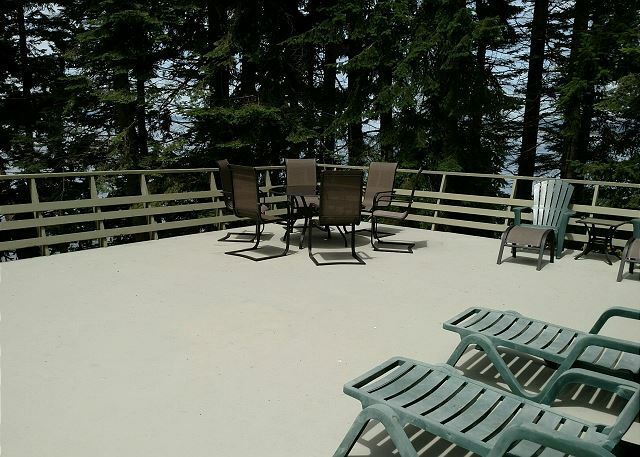 We're so glad you enjoyed the view, the living room, and the deck! So sorry for the dust and the towels. We will pass that suggestion onto the cleaner. Thanks for your review! We Had a great time on Whidbey Island. The house was perfect for my one daughter & 2 kids from Idaho, another daughter living on the Island & my other daughter, son-in-law & 2 kids & I from CA. The house was clean & we enjoyed the sights on the Island & Seattle. We are so glad you enjoyed your stay! Thanks for your review! We found this house to be the perfect layout for our group of eight: two teenagers, one 11 year old, and the rest adults. Especially enjoyed the two kitchens. Also liked the tame deer, owls, and other wildlife. We are glad you enjoyed your stay. Thank you for your review! The house we had was perfect for our large family vacation with 3 generations of family coming. We kept busy up there, mainly crabbing along Whidbey Island's eastern shore. The location was great and the home was very spacious. Loved having the spacious upstairs deck to relax on. Great views of the Sound through the trees. Very quiet and peaceful. The upstairs kitchen really wasn't stocked at all, though there was a bit more downstairs. The water pressure in the entire house was not great, including the kitchen sink. I think the house overall could use some updating, but it was about as expected price wise for the condition. This is a great vacation property for a large group. We did find some spiders making webs and in the beds but other than that it was clean. The path to the beach is not good - made for goats and needs some upkeep. Pots and pans could use an update for the price of the rental. No fire pit - that is a shame for a beach cabin. We met with friends for a long weekend and had a great stay on the island! This place was perfect for my 6 friends and I. We all had a room to sleep in, and we were able to all get together and socialize in the living area downstairs. We didn't even use the upstairs kitchen and patio, even though it had spectacular views. The only things I didn't like were the 11 am check out time, the room that everyone had to walk through to get to the downstairs living room, and a few spiders. These were minor issues, but this place overall was awesome. We will be coming back! It's a terrific place for a family gathering, especially the downstairs with its large room and great views. Kitchen could be better stocked, but that's minor. We would stay there again. Lovely wooded setting w/a beautiful view! We had a large group and rented both the large house and cabin. Great to have the homes share the same property, yet there was total privacy between them. The decks on front of homes both had terrific views. We especially liked watching the freighters and Clipper go by. Access to beach was quick, but a little steep and narrow. Not bad for the average person. Half the beds were in terrible shape, the other half were great. Some maintenance issues w/the large house and there's nothing fancy about these places. Upstairs kitchen was not really functional, which was disappointing! Overall, we had a great stay though and would probably come back again. Property management company was great to work with and properties were very clean. Went to go on the beach (that they had just had a big party on the night before) and was told we couldn't because of the wild life they were trying to save. I understand that but there was a section roped off just for that. So just kind of bummed about that. the rental property was perfectly nice, about on par with what I expect from a rental house. everything was clean, they had good knives (always a plus). It was listed as 4 bedrooms, which may be a strech--it has 3 bedrooms, and 3 living areas with bed/pull out options. The greatest part was the amazing view above the bluff. But I would make sure that visitors know that the path to the beach is pretty treachorous, not great for older folks. All was fine with the exception of the front door , where the lock was dysfunctional and the clothes washer was broken......location was ideal and everyone ahd a wonderful time. Apologies to the renters about the lock. Since has been fixed! Washing machine is also brand new, but had some issues after install and has been resolved. This is a nice sized, very basic cabin with a nice view and great beach access. Great views from the ample deck and basement living room. 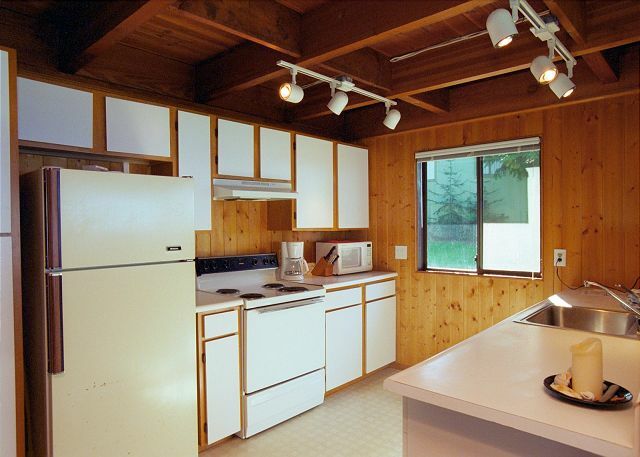 Kitchens are outdated but totally functional. Decor is older but funky in a fun way. It was cozy and tucked away from the public which was so pleasant. The only thing was it smelt very strong of something musty. We opened all the doors and Windows and that fixed it for the most part. I definitely plan to stay here again in 2012 if possible. The condition of the house (old and stale smell, bottom floor bathroom has poor drainage, ran out of toilet paper) was only a slight nuisance. The beauty of the view, the ease of access to the beach behind the house and the overall quaintness and secludedness of the area made up for all of those things. The house had spectacular views and PLENTY of space to sun around and do activities in. Overall, great place to stay although I would have like the drainage problem to be fixed before we got there. We enjoyed our time very much. There was lots of room to spread out in. The kids enjoyed the beach, even though it was winter. At first some of the heaters wouldn't work, but the property manager had that fixed. We would go there again. The house and location are superb. Short walk to beach, views... The only minor issues was, there seems to be mice, or evidence of mice in the house. Other than that, it was great. We have stayed at this property before, a few years ago, so we knew it could accomodate all of us parents, kids and grandkids. However, we were told it would sleep nine. This was including the sofa bed and futon. But there was no sheets provided for these beds, only blankets. It is kind of "icky" to sleep with blankets only (when you don't know who used them before you). It would have been nice to have clean sheets. And I would have brought some myself, if I would have known that I needed to. Oh...for your information...the upstairs toaster did not work, so we switched it with the downstairs one provided and used it instead.